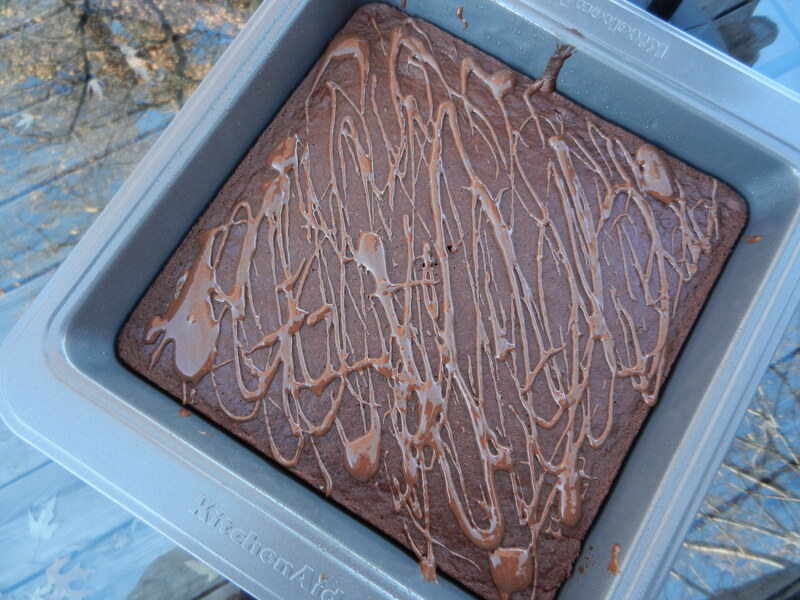 Since I kind of dove deep yesterday into the topic of curbing my sweet tooth, I didn’t get the chance to share the rest of my kitchen adventures with you from the weekend. Even though it’s already Tuesday, I still want to catch up. There’s no better time than right now! On Saturday I broke out the food dehydrator. I sliced up fresh bananas which I rolled in melted coconut oil, and frozen strawberries which I thawed in the microwave and sliced thin, and placed them on the dehydrator trays. I let them go for 7 hours. The bananas came out great as they always do, but the strawberries were just kind of ‘meh’ to me. They are good, just not goooooood. I still enjoy them though! For dinner Saturday night I had not a clue what I was going to make. After taking inventory in the fridge and freezer, I pulled out a bunch of veggies and got chopping. First I sliced a whole lot of brussels sprouts into shreds. I sprayed them with olive oil, salt, and pepper, and roasted them for about 20 minutes in the oven. In the mean time, I sautéed carrots, onion, mushrooms, and one garlic clove. In a separate pan, I cooked two strips of turkey bacon. Once the veggies were nearly done on the stove top, I added pre-cooked brown lentils to them, added a pinch of savory seasoning, salt, and pepper, and gave it a good stir. Once the brussels sprouts were done roasting and the lentils were warmed through, I began plating. First, the lentils and sautéed veggies, next the roasted brussels sprouts, and finally, the icing on the cake, the turkey bacon cut into confetti pieces. This dish was outstanding! There was so much flavor, it was very hearty, and it was full of stick to your ribs soluble fiber. I LOVED it. Dana gave it two thumbs up as well. I already showed you my breakfast in yesterday’s post, so moving on to lunch. After running our normal Target and Costco errands, and grabbing a few nummy samples along the way, I wasn’t that hungry for lunch, but since Dana and I still had more errands to run, I knew I had to eat something to hold me over. I threw together a salad made of mixed dark greens, blueberries, feta cheese, and almonds. Sunday evening dinner was sesame soy salmon. I marinated the salmon in a mixture of low sodium soy sauce, sesame oil, dried ginger, one minced garlic clove, and honey for about one hour. We grilled it on the stove top inside, about 4-5 minutes on each side, until cooked through. I cranked the windows open, turned the vents on high above the stove, and still wound up with a house that smelled like sesame salmon. I’m anxious for the weather to warm up just even slightly so we can grill outside again. The marinade gave a nice crispy crust to the salmon which was what I was hoping for. Salmon is one of those foods that I hope grows on me. I’m just not a huge fan…yet. The plan is to eat salmon once a week, in hopes that I will start liking it more and more. It is just so darn healthy and I don’t want to be missing out on that! I didn’t like red wine at first, but I kept trying it and now I love it so I’m hoping for the same effect. We shall see. 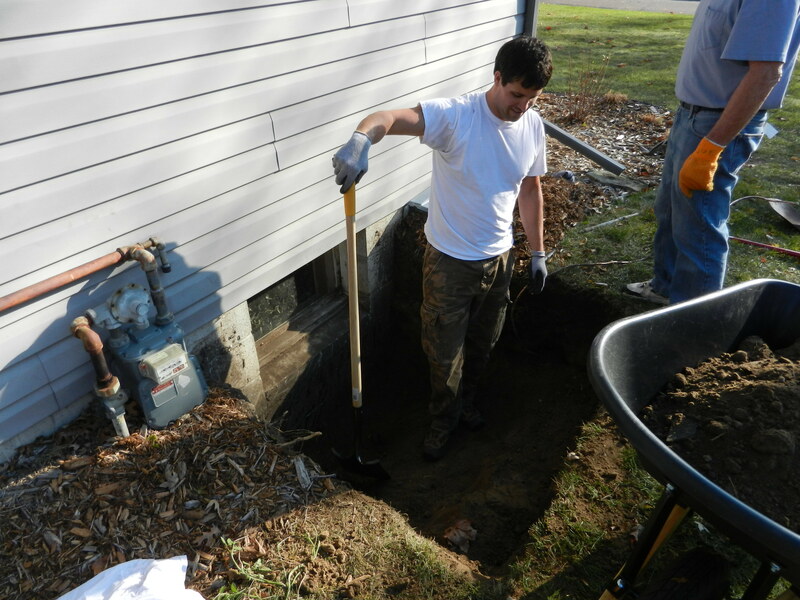 We began a very exciting project around our house on Sunday. We are “remodeling” our laundry room. I use the term loosely because technically in order to remodel something it has to already be modeled, right? Well ours isn’t. Ours wasn’t even fully sheet-rocked yet. It needs a lot of TLC and that is exactly what we’re giving it. We will be painting the walls, tiling the floor, putting sheet rock up on the necessary walls, and we will be reorganizing. Our basement is completely unfinished except for the bathroom which we completed last year (whoops except I still need to decorate one wall in there). This is one more step in the right direction in finishing that basement and I am ecstatic about it. Once we have the laundry room completed, I will be sure to show you before and after photos. Mission laundry room! One last thing. Since it is now the 4th week of January, that means that there is a new workout posted in the 30 Day Abs Challenge. Here it is! Questions of the day: What health goals have you made recently? What are your goals for future months? I am thinking I may need to find another fitness challenge for the month of February. I love how these monthly challenges motivate me and I enjoy the support of other people partaking in the challenge. I like to set goals and reach those goals! Hello there! Happy Sunday my friends. What’s everyone have on the agenda? Resting and relaxing or running errands and prepping for the week ahead? Whatever it may be I hope it’s a good one so far! I still have yet to recap the second part of our Colombia vacation but I was really itching to write a “normal” post plus I have a recipe I want to share with you all, so the second recap will have to wait a little while longer. Here’s the Miami recap, and Colombia Part I recap if you’re interested. I have a little bit of catching up to do from Friday first so we’re going to be starting off there right at lunch time. To celebrate my birthday (a week early) my co-workers and I went out to Houlihan’s for lunch. I received a free $15 coupon for my birthday to the restaurant so that’s why we decided to go there. 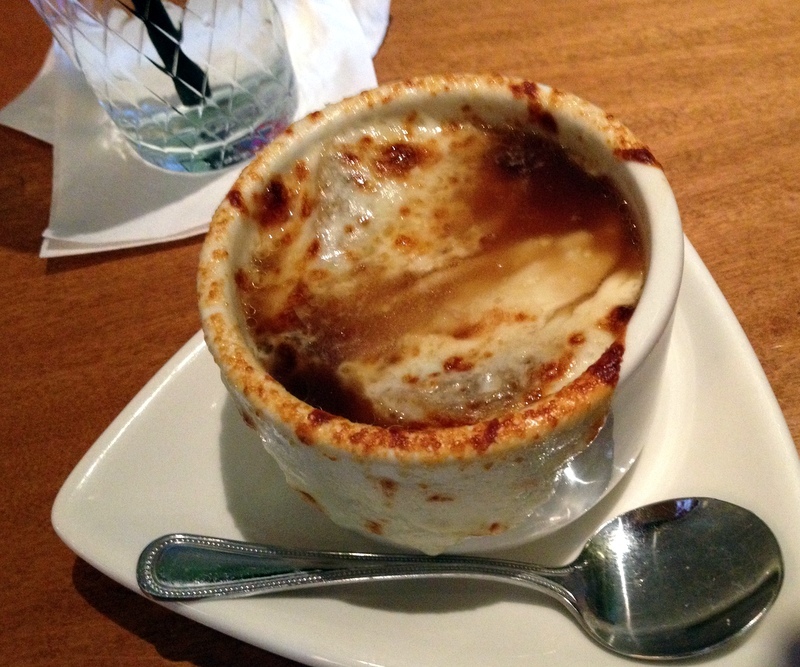 I ordered the french onion soup and a caesar salad with grilled chicken and polenta croutons. I was very happy with both of my selections. This is your forewarning that the meal you are about to see is one of the most unappetizing dishes ever to appear on BN. However, I promise you that although unappealing to the eyes, it is very appealing to the palate. 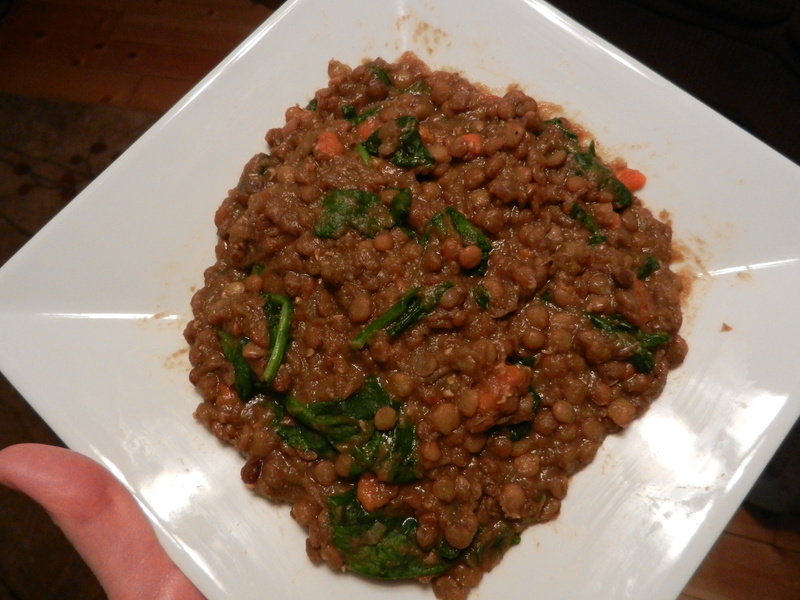 After I plated the lentils over the spinach, I stirred the warm lentils into the spinach and decided that I liked it that way better. Oh yes I am falling in love with lentils. First the Curry Stew and now this. In a medium saucepan, saute onions and carrots on stovetop for 3 minutes. Add in spices and stir. Add in chicken broth, stir, reduce heat to simmer, cover and let simmer for 2 hours; stirring occasionally. 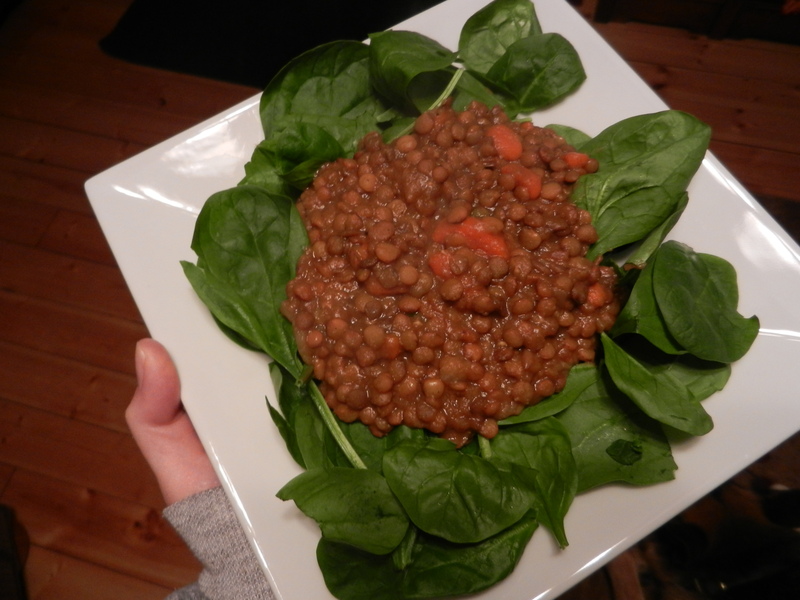 Before serving, add spinach and stir in until it wilts into lentils. 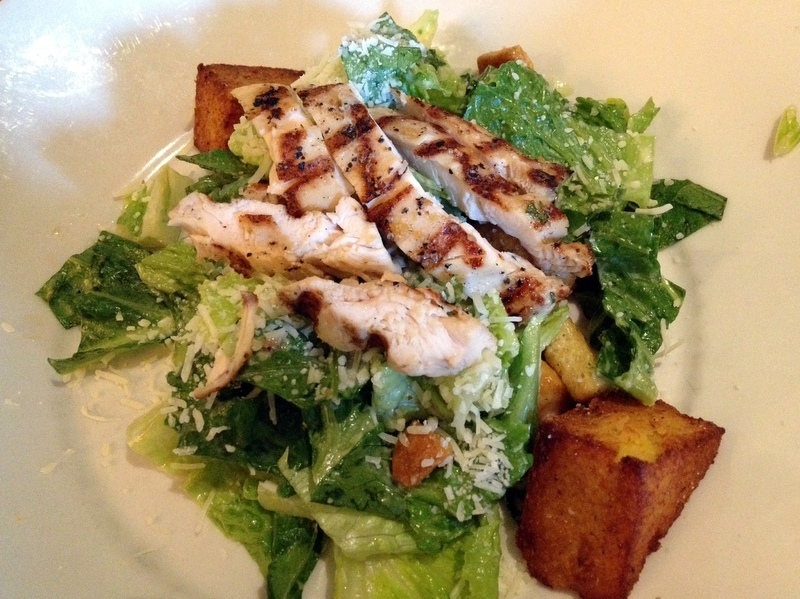 It’s such a hearty and healthy dish that I truly enjoyed (and Dana did too). 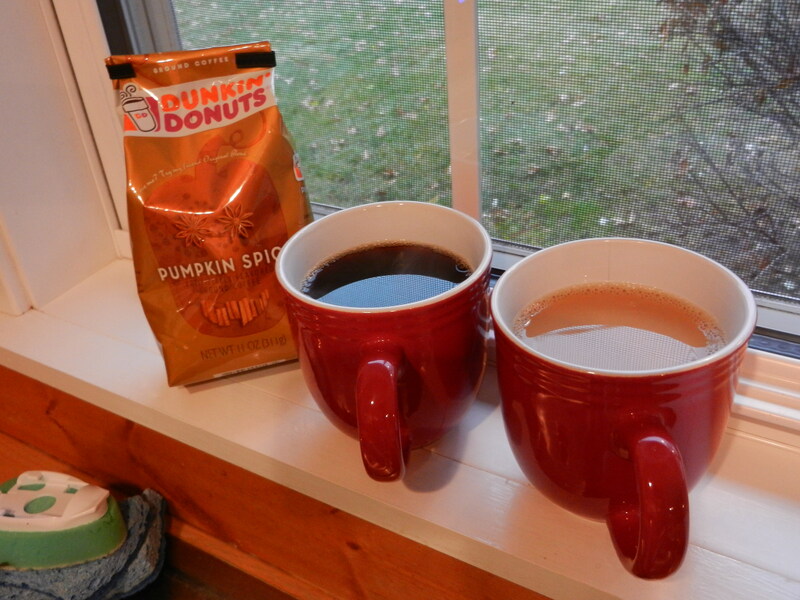 I enjoyed two cups of Dunkin Donut’s Pumpkin Spice coffee with hazelnut creamer to kickstart my morning. Have you tried this stuff?! If you haven’t please go buy some. You won’t regret it. NUM. Next was breakfast. 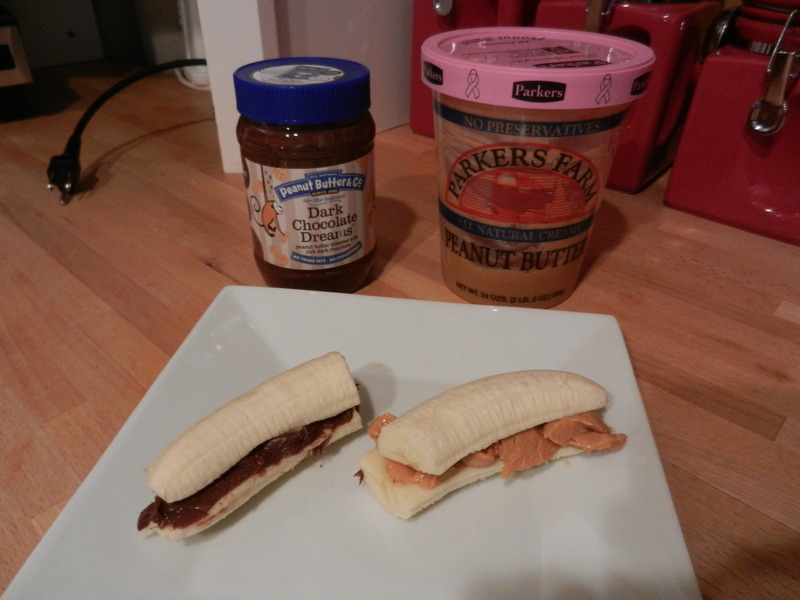 I topped one banana half with Parkers Farm creamy peanut butter and the other half with Peanut Butter & Co’s Dark Chocolate Dreams peanut butter. Yes it is a dream how good that stuff is. A dangerous dream. Thanks to Peanut Butter & Co. for sending me some coupons for their heavenly product. I gave breakfast time to settle while watching two episodes of Anthony Bourdain’s No Reservations, Dominican Republic and Maine. Both episodes were great. His humor cracks me up. 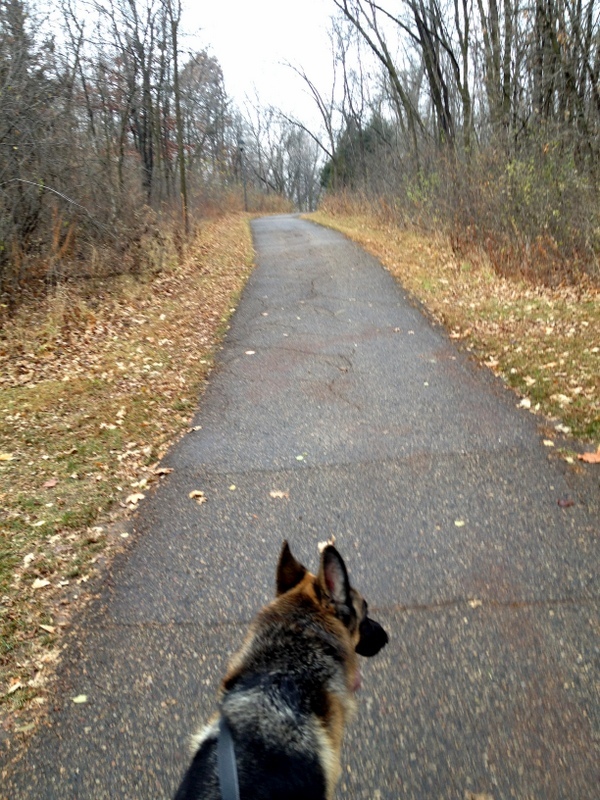 Then it was time to lace up and head out the door and face the dreary morning with a run. Moose surely didn’t care that it was drizzly and dreary, he was so ready to go. We trekked through the neighborhood and covered about 4 miles. 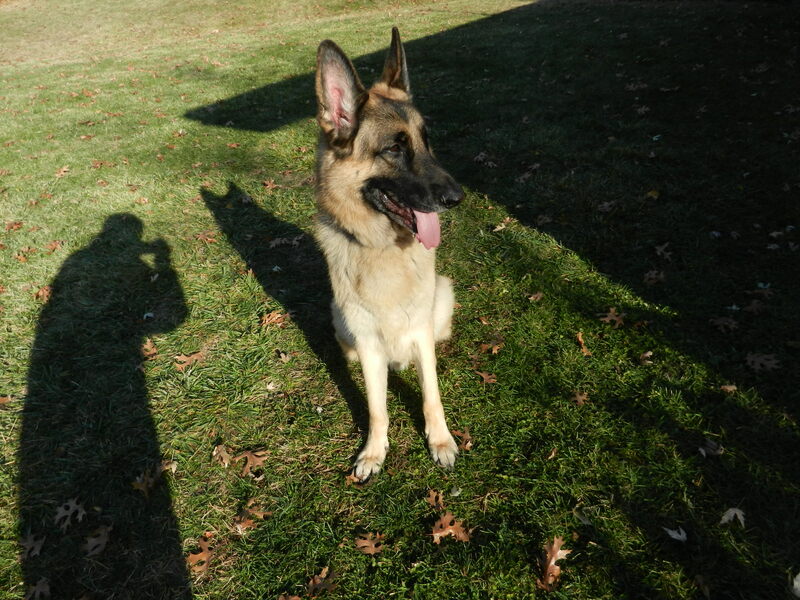 The rest of the day was spent cleaning up the house, “helping” Dana dig out the window well to prepare for egress windows so that we can finish our basement at some point, putting the patio furniture away for the season, hanging out with Moose, and baking up a treat for the worker crew. I hope you’re having an excellent weekend. Catch up with you all later!